You've got style. We know that. But even with a sense of style, it can be difficult to choose furniture that reflects your style. Most people haven't picked out tables as often as they've picked out, say, what to wear every day. For that reason, we've put together this guide to help you dress your room as well as you dress yourself. Dining room tables are especially important to a room's look and feel. In most cases, it will be the first piece of furniture that you and your guests see when they enter the room. Pick out a dining table that reflects your own unique personality. The rest of the furniture-selection process will come naturally. Table styles tell you what a table is all about — whether it means business or just wants to relax and take the day off. All these different styles were thoughtfully developed in various places, throughout history. Some styles have been around forever, and some are more recent. What these styles have in common, however, is that they all look good — each in its own way. Whatever style you connect with most, Brosa has just the table for you. French Provincial furniture is timeless, functional, and simple. Furniture once owned by middle and lower class French citizens in the 17th and 18th centuries is now a staple of modern design. Nowadays, French Provincial furniture is used in more elegant settings than in the past. This style of table is never overly complicated. Built in the same style of furniture of the past, it gets the job done and looks great. 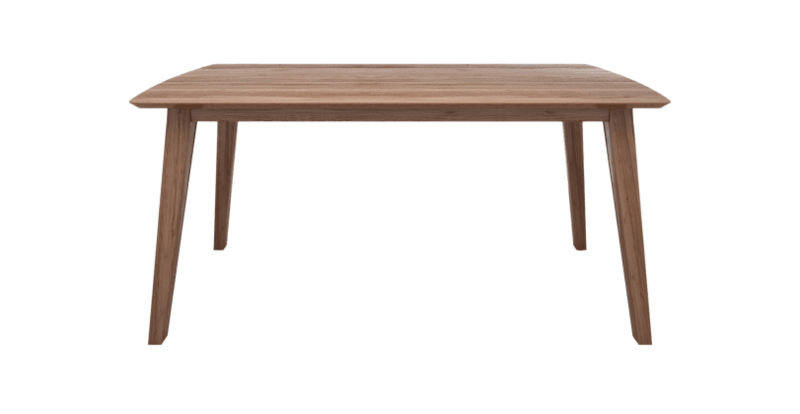 From our collection of tables, look for simple shapes and lighter-coloured, natural wood. French Provincial furniture fits in with almost any furniture and decorations and is perfect for those who want a dining room that can be both casual and elegant, depending on the occasion. Contemporary furniture is minimalist, relaxed, and practical. Influenced by the modernist art movement in the 19th century, contemporary furniture features slender forms made from metal or wood, or both. Contemporary tables get the job done without boasting of their accomplishment. They only take up as much space as is needed to hold whatever you need them to. 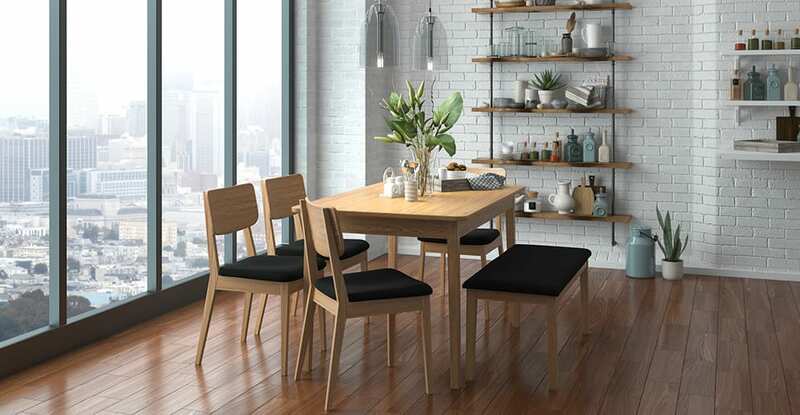 These tables are perfect for those with relaxed lifestyles who want a more modern-looking dining room. Industrial furniture is neutral, functional, and raw — it doesn't try to be anything except what it is. Industrial tables combine wood and metal without attempting to hide how the table was built. 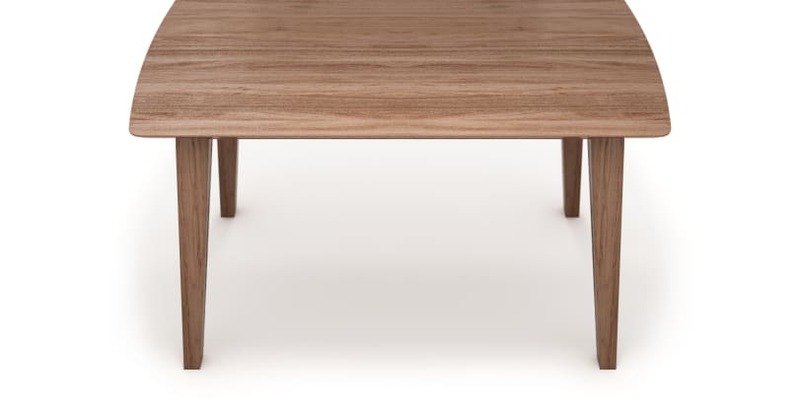 These tables want you to see that they are human-made products. What you see is what you get. These tables would look great in confident and cool-coloured dining rooms. If you aren't sure what kind of dining room you're going for or don't want to deal with trying to match everything, try an industrial. Their exposed, raw look tends to go well with just about everything. Scandinavian furniture is clean, simple, and natural. Scandinavian furniture is meant to last. Both physically and stylistically. A Scandinavian table will never go out of style. Scandinavian furniture is supposed to be used. This is why it is built to look good and last forever. Look for clean lines and natural-looking wood, often in lighter colours. A Scandinavian table would be perfect for anyone who wants a warm, friendly atmosphere. Their lighter colours would look great in rooms with lighter walls and floors. If you want to use your dining room and admire it at the same time, try one of these tables. Classic Traditional furniture is comfortable and calm — not too simple, and not too complicated. Matching and consistency are essential to this style's look. This furniture looks great to all age groups. If you have children or multiple generations eating at your house, Classic Traditional may be the way to go. A Classic Traditional table is ideal for those who value calmness and peace of mind above most else. These tables are comfortable and won't try to surprise you with extreme colours. So comfortable your guests may not realise they aren't eating in their own home. Mid-Century furniture is uncomplicated, youthful, and organic. This kind of furniture is a cross between modern art and functionality. These tables focus on looking good and fresh but also being useful. Expect these tables to have smooth lines and be brighter than tables of other styles. 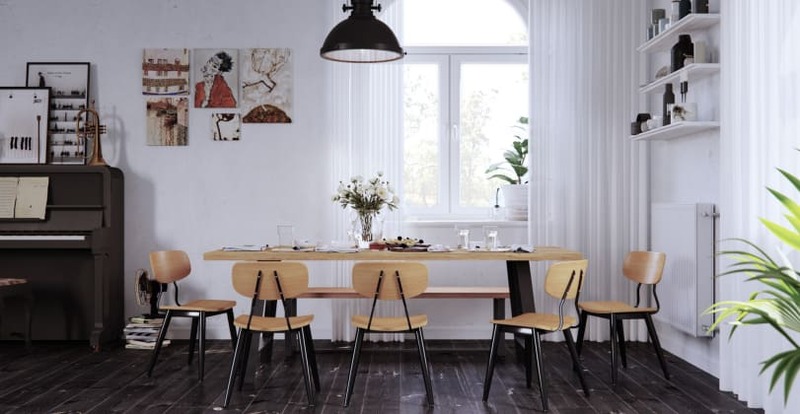 Mix some lighter colour chairs and decorations into a Mid-Century dining room to complete the look. A Mid-Century table would be perfect for those looking for a dining room that invites them to breakfast every morning with a bright smile. These tables are a breath of fresh air and can put a spring in anyone's step. Japanese furniture is open, natural, and minimal. Japanese tables use natural colours and shapes. They are never extreme and will never distract you. Japanese tables are usually somewhere in between nearly white and dark brown. They express a full range of emotion without being too bright or too dark. Japanese furniture doesn't distract. Except when you want to stop and admire its simplistic beauty. A Japanese table would look great in a dining room focusing on looking earthly or peaceful. If you like to wake up and take a breath of fresh air outside before you start your day, a Japanese table would be a perfect addition to your daily routines. Once you've got a style picked out, it's time to choose a design. A roundtable is a perfect fit for a dining room on the smaller side. It doesn't take up unnecessary space with its lack of corners. A roundtable can make a room appear more open and inviting. This table design is perhaps the most intimate. The downside of the roundtable is that it cannot seat a large number of people. The larger a roundtable, the further away all your guests will be from each other. And this is probably not what you want. A large round table also takes up more space than a rectangular table that seats the same number of people. If you have a smaller room, do not need to seat more than six to eight people, or desire intimate meals with a few guests, a roundtable is for you. Square tables look best in square-shaped rooms. Like a round table, a square table keeps meals smaller and intimate. If space is tight, a square table can be best. Unlike a roundtable, a square table can be placed against a wall if necessary. If you want a table that can be intimate and fit many guests, try an extendable square table. You can have daily meals without being surrounded by empty chairs, and extend the table for special occasions. 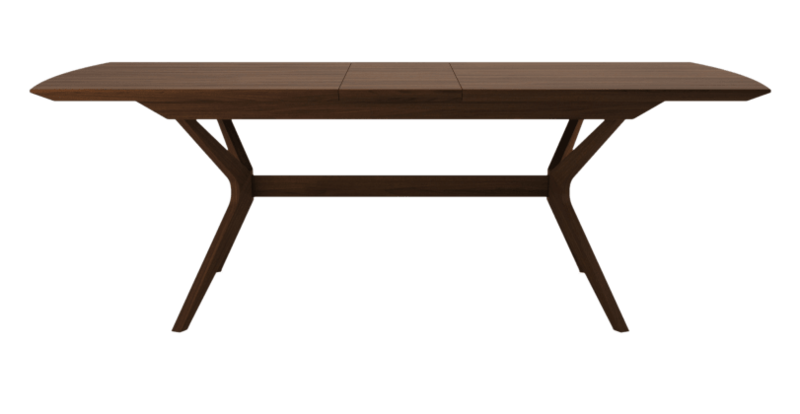 Rectangular tables are suitable for larger or rectangular-shaped rooms. They fit a large number of people most space-efficiently. These tables are ideal for those with large families. Or for those who host large parties. 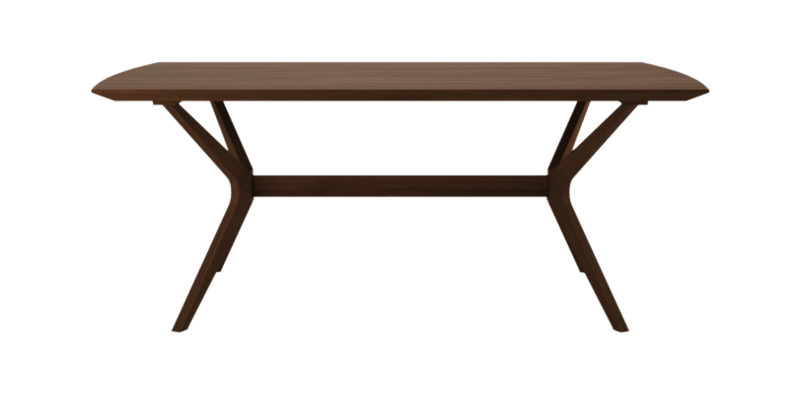 Rectangular tables are great multi-purpose tables. 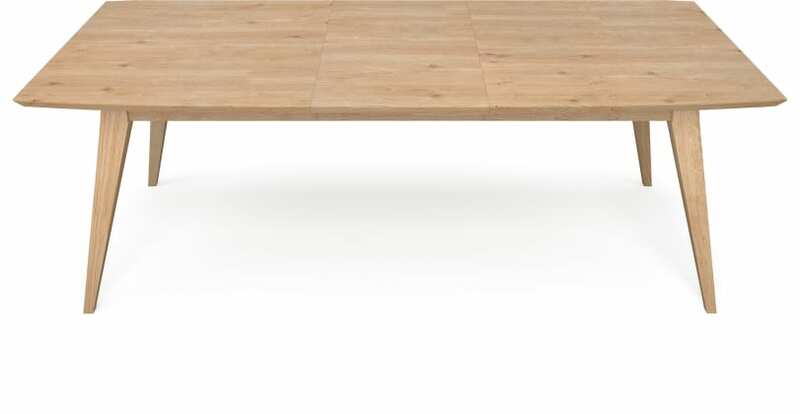 Whether you're doing a bit of work at home or your kids have school work they need help with, a rectangular table can be used for almost any purpose. Extendable tables were invented to serve those who host large events only occasionally. Search our catalogue for an extendable table if you want to save space but also be able to serve the masses from time to time. It goes without saying that outdoor tables were made to be used outside. 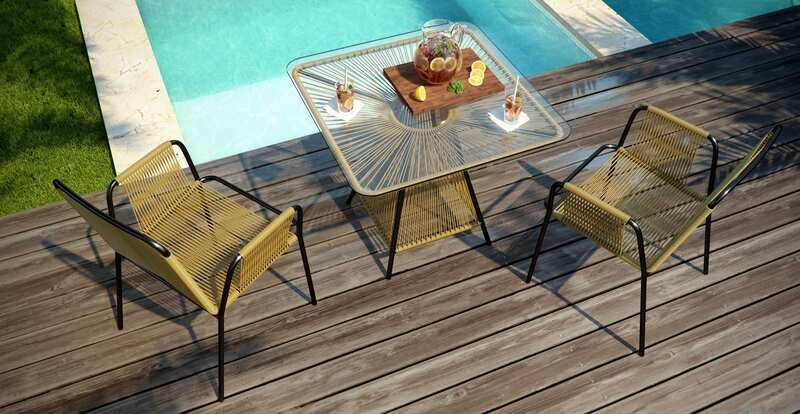 If you enjoy eating or hosting parties outside in the fresh air, check out our selection of outdoor dining tables. They're weather resistant and designed to hold up against outdoor weather.